PMA is pleased to highlight Perry Hytken, sales for Ace Machine and Metal Fabrication, Nashville, TN. The company is a turnkey machine and fabrication shop that has been in business for more than 40 years in the middle Tennessee area. Its 50,000 sq. ft. of manufacturing space allows for the production of large precise parts and those that require simple forming or punching. 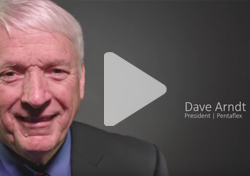 Hear Perry's thoughts about technology challenges facing metalformers, what’s on his wish list for his plant next year, the best conference he and his employees have attended in the last year, and more! A: Being a full line job shop, our company offers machining, fabrication, welding, laser, turret punching and powder coating. It has become a great challenge to find young talent to learn the trade of each aspect of these skills. The Tennessee District has made an effort to have an event at a technical college and bring in high school students to see firsthand how these skills can be learned. With such a shortage of skilled labor, it is important to work directly with the local high schools to educate them about the success that can be achieved in the manufacturing industry. A: Customers expect products delivered ASAP. Bringing new equipment in creates new opportunities for additional business. The newer technology in equipment will save time and money. The real challenge is balancing the learning curve for the operators and customer demand. Once the learning curve is achieved, quality, production and lead times will improve greatly. A: We are adding new equipment each year. This year we have a new press brake, machining center and lathe. Next year we are looking at an additional laser. We will look at other new equipment with customers’ demands. 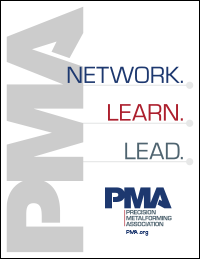 A: I attended the PMA annual district leadership conference last year in Independence, OH, where I was able to learn new leadership skills that benefited my business and the local Tennessee District of PMA. I also learned new tools to use as the district chair. The people that attended created an excellent opportunity for networking. A: Since I travel a good amount for business, sedan has always been my preference in transportation. My Lincoln Towncar has plenty of room for my clients and me.